Although our trek through the Annapurna Conservation Area was all about the mountains (or at least, for me it was), the foothills had a beauty that was worth the passage in its own right. We started our journey from the hamlet of Phedi, at the roadside running north away from Pokhara. Up a staircase for a couple of hours to the little town of Dhampus, where we spent the first night, then on through the Maoist checkpoint and into Annapurna country proper. The path varies, from winding, uneven staircases that break the heart on the way up and the knees on the way down, to overhung forests of rhododendron and other matted trees, dense and moist and cool out of the strong sunlight. The path doesn’t stay on one level for more than a few minutes at a time. No sooner have you crested one ridge than it’s time to plummet down into the next valley, and within a few minutes you’ve undone all the good climbing work you’ve sweated out for the previous three hours. Day two, the afternoon after leaving Dhampus, we come across the panorama above. Steep terraced hillsides notched into the slope with the contours, green and glowing beneath a clear blue sky. Above it all, Annapurna South basks in the afternoon sunshine, and between it and its shoulder-peak Hiun Chuli, the crown of the gargantuan Annapurna I, 10th highest mountain on Planet Earth, can be made out just behind and to the right of Annapurna South, slightly masked by wisps of cloud. We spent the night just around the spur you see here, in the quaint little village of Landruk. These lower villages have a certain charm that is lost higher up, in that these are genuine settlements in their own right, and although they take a huge portion of their income from the tourist trade, so too there are shopkeepers and farmers and herders and schoolteachers and children and all the other trappings of rural life. I assume that living in a place like this, growing up beneath a mountain such as Annapurna, you become a little blasé about it. I wonder if the villagers stop seeing it after a while? But then, growing up in Switzerland I never tired of seeing Mt. Blanc towering behind the lake, so maybe they don’t. From Landruk it’s another day to Chomrong, memorable for the two-thousand-step staircase that is Main Street. I kid you not- there is over a vertical kilometre between the top of the town and the houses near the river at the bottom. If you had to commute here you’d keep fit and healthy, no doubt about it. From Chomrong inwards, virtually all of the settlements are seasonal, existing only to cater to trekkers, and once the winter snows roll in and the passes into the Annapurna Sanctuary close, they empty for the season. Places like Bamboo, Deurali, and half a dozen other little blue-roofed hamlets spotted along the footpath that skirts the Modi Khola river between Machapuchare and Hiun Chuli. These places are set in stark landscapes of rock and the dwindling forest as the altitude climbs. Tall cliffs rise up around them and the scenery is striking. They’re exciting to be sure. But they have none of the beautiful simplicity and lush variety that makes the hill-country such a pleasure to trek through. 1. Foothills: Terraces and homes as the trail approaches Landruk in the Annapurna Conservation Area. Annapurna South (L- 7,219m), Annapurna I (C- 8,091m), Hiun Chuli (R-6,441m). 3. 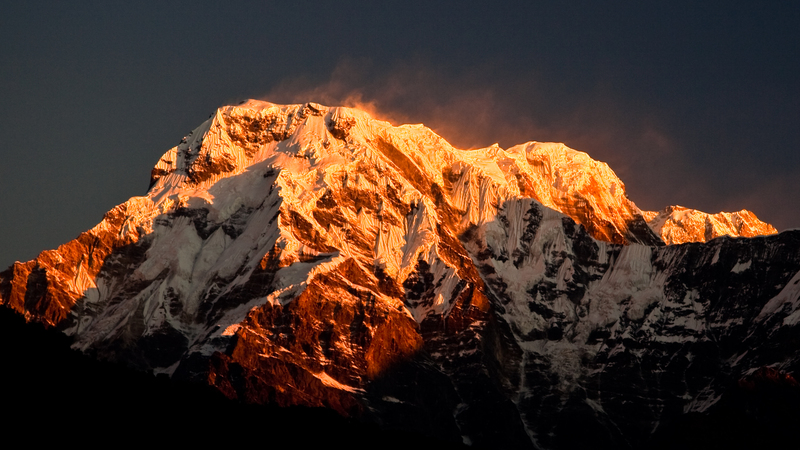 Annapurna Massif: The eastern arm of the Annapurna Himal is viewed from a ridgeline a little north of Dhampus. 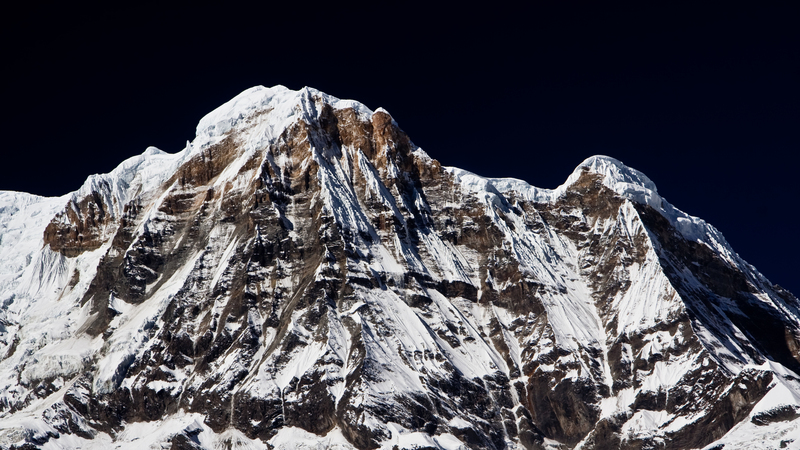 Annapurna IV (7,525m) is the pointy bit at the leftwards edge, and Annapurna II (7,939m) is the giant bare-faced pyramid behind and to the right. 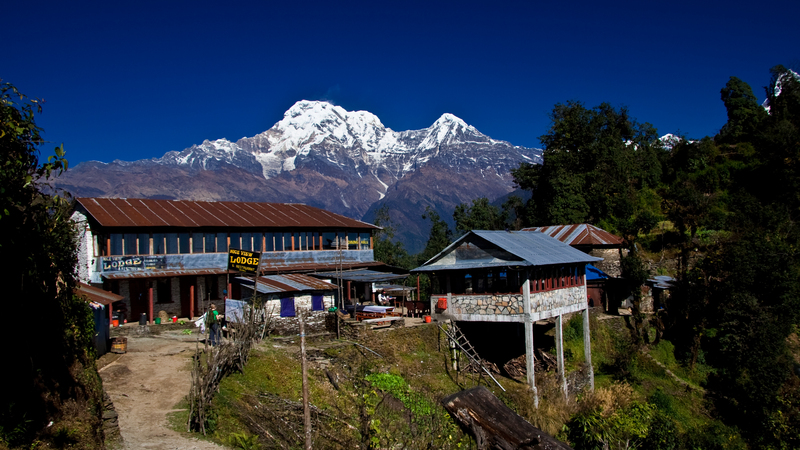 Lamjung Himal (6,931m) is the other prominent peak to the right side of the range. It should be noted that the four Annapurnas are numbered not in any geographical location to one another (indeed there are a host of named peaks between Annapurna I and Annapurna II) but in descending altitude.